By now, at least everyone around you has had a taste of the free-to-play hit card game Hearthstone: Heroes of Warcraft. It’s a game that did the unthinkable, and that’s create a community that wasn’t just happy to join, but actually throw cash at Blizzard for more cards. Hearthstone expands soon with a single-player addition. It’ll be out rather soon actually. “Just wanted to give everyone a head’s up that we are currently targeting to release Curse of Naxxramas during the month of July,” a post on the Battle.net forum read. Unfortunately, we still have a lot of implementing and bug fixing to get through, so please stay tuned! 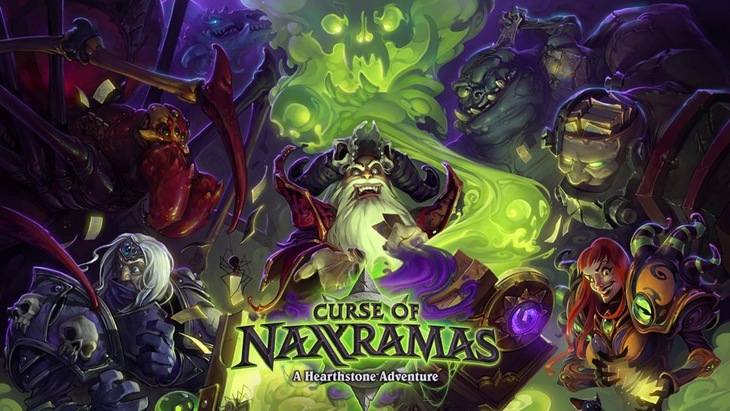 With that said, we are also targeting to reveal pricing details regarding Curse of Naxxramas next week on July 1, so please keep an eye out for that. So what do your bucks get you? According to Blizzard, Curse of Nik Naks Naxxramas will send players to a floating Necropolis in the sky “with the stuff of nightmares” and more Warcraft lore than you can shake a stick at. You’ll need to set up a deck, choose a hero and venture into the unknown in order to take down various bosses across several levels as the Curse of Knick Knack Paddy Whack Naxxramas plays out over five weeks. It’ll hit iPad, Mac and PC simultaneously when it arrives. Should be interesting to see if Hearthstone fans are keen to adopt this. You reckon you’ll be able to brave the tombs of the Curse of Nakatomi Plaza Naxxramas?